Hi, friends! I’m here to tell you all about mermaids that live in the South Pacific. [Tee hee!] Well, okay… actually I’m going to tell you about the dugong! We’ve all heard stories about pirates who saw mermaids swimming in the water around their ships. Some pirates became so obsessed with capturing these lovely maidens, they would follow them far into the open ocean! I’ve got news for the pirates: mermaids do not exist. But dugongs do! Many people think pirates mistook these large marine mammals for mermaids. These slow-moving, gentle creatures live in the water across Oceania. Around 10,000 dugongs live in the ocean waters north of Australia. The dugong is a unique animal. It isn’t a whale, though it looks like one. It is related to the manatee, which is commonly found in the Caribbean Ocean. The dugong looks a little like an underwater walrus, but with a tail like a dolphin! Neat, huh? Dugongs can stay underwater for up to six minutes before they needs to come up for a breath. Like whales, they communicate using chirps and songs. Because their eyesight is poor, dugongs rely mostly on these sounds for communication. 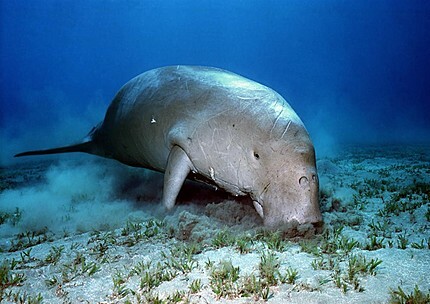 Another neat things about dugongs is that they are herbivores. That means that they only eat plants! They travel along the ocean floor eating seagrass, using their fins and tail to move slowly and gracefully. Dugongs are very social animals. Sometimes they gather in big groups, up to a few hundred. They call that a du-gang. [Just kidding!] One of the neatest things about dugongs is that they have an incredible memory. A dugong will travel far and wide throughout the year, but they always return to their home waters. They can live for up to 50 years! So maybe pirates didn’t see mermaids, but it turns out they saw something just as wonderful: the dugong!